Get Over $125 in Freebies & Discounts When You Pre-Order My Book! 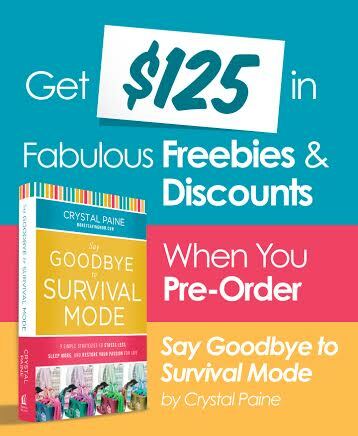 Remember yesterday when I told you that I’d have an AMAZING freebie package for each of you who pre-ordered a copy of my new book, Say Goodbye to Survival Mode? Well, it’s ready and I am so excited to share what we’ve put together. My team has worked so hard to pull this together and we hope you are as thrilled with it as we are! It’s our way of saying a big thank you for how you are coming behind and supporting my book launch. Truly, you all mean the world to us. So, here’s how it works: Every single person who pre-orders a copy of my book from any retailer gets the following Freebies & Deals Package — worth over $125! What’s Included in the $125-Value Freebies & Coupons Package? A FREE 3-month subscription to List PlanIt or three Free ePlanners from their store (your choice). List PlanIt helps you to organize your world by creating and managing lists that can be used at home or on the go. $15 value. A FREE three-month membership to Yumprint Premium. YumPrint is a site that helps you save money on groceries. You can save recipes from anywhere on the web, plan menus, and create shopping lists. They help you cook what’s on sale and know where to shop to save the most. $30 value. A FREE 2-month subscription to JellyTelly.com. JellyTelly is the best Children’s network for Christian kids videos, games, and more. In addition, everyone who signs up for the free two-month subscription will also get a coupon code good for $5 off any What’s In The Bible? DVD (created by Phil Vischer, the originator of Veggie Tales). Our family LOVES this company! $15 value. A 40% coupon code good any fabrics or patterns from Marie Madeline Studios. Marie Madeline offers a fun variety of high-quality cotton fabrics, along with their exclusive line of boutique style sewing patterns for ladies and girls. They have adorable items in their shop — go check it out! A FREE 2014 Motivated Moms Planner eBook. Motivated Moms is a chore planning system designed to help anyone keep a clean and organized home. Each day, you’ll get a preplanned list of chores. Just consult the list, do the chores, check off the tasks, and you are done for the day! $10 value. A $10 off $20 coupon code good on any new customer order from ThredUP.com. ThredUp helps you save on your favorite, brand-name clothing for women, children, and juniors. Shop top brands like Ralph Lauren, J. Crew, and GAP and save up to 90% off retail prices! A FREE 4 oz. Fractionated Coconut Carrier Oil with any purchase from Plant Therapy. Plant Therapy is a company that offers essential oils for some of the best prices you’ll find on the internet! $7.99 value. A FREE pair of Rachelle earrings with any purchase from Cents of Style. Cents of Style is a site dedicated to helping you look and feel great on a budget. Plus, they offer free shipping on all orders. $20 value. 30% off any meal plan from EMeals. EMeals covers everything from Paleo to low fat to gluten-free and includes over 50 different options! The average eMeals customer saves hundreds of dollars per year by using eMeals for their meal planning. This coupon code is good on any of their meal plans, including breakfast, lunch & dinner — a $17.50 value on a 12-month subscription! 2. Once you’ve done that, just click this link and fill out the form. 3. That’s it! As soon as you submit the form and verify your email address, you will get an automated email giving you access to the free bonuses and exclusive coupon codes. Psst! Want to buy a copy of this book for a friend? You can pre-order for them and gift the freebies package to them, too! Talk about getting a great bang for your buck! Again, thank you so very much for your support of this book launch. Your excitement, enthusiasm, and cheerleading of this project blows me away. I am deeply and humbly grateful for each of you! I was unable to attach my receipt on the link, so I took a screen shot like it said. It still has not taken it. Can you email me? crystal@moneysavingmom.com — I’ll make sure your get the download page. So sorry for the issues! Crystal, I submitted the form just fine..thanks! I’m most excited about the motivated moms planner. I’ve tried to get it and haven’t gotten an email from them yet (which it says I should receive as soon as I filled out their form–which I’ve done twice now). Any suggestions? It may take a bit for it to come. However, if you don’t get it within an hour or so, email amy@moneysavingmom.com and she’ll put you in touch with the wonderful folks at Motivated Moms who should be able to help you out. Thanks, Crystal! And thank you for putting together such a great package! Tara – can you email me at susanc@motivatedmoms.com? I just tested the promo link and it worked for me but we will try to find out why some of you are having problems. Thanks for your patience! Thanks, Susan. I just sent you an email. I’m having problems with the Motivated Moms planner also. I filled out their form and they emailed me a link immediately, but the link they sent only takes me to their form again. Can you email amy@moneysavingmom.com? She’ll get you in touch with the folks at Motivated Moms. We’re contacting them right now, too, to see what’s up. Brandi – can you email me at susanc@motivatedmoms.com? I just tested and was able to get the link to work but we would like to resolve this for you. Thanks for your patience! Susan– I forwarded a copy of the email that I received. Thank you for looking into this. I got the same thing, but filled it out (a second time), and got a download email not long after that. Kind of weird, but it did work. So glad you got it to work! Sorry for the issues! Thank you so much! I am so excited for all of these! The confirmation worked and I received my email with the links. I CANNOT wait to read this book!!! I’m so tired of putting out fires and living minute-by-minute. Thank you, thank you! You are so very welcome! And thank you for your kind encouragement! I preordered it. Might even let my wife read it…might. Also….is th iOS version going to be available soon? Hi Audrey, this is just a special ebook edition we put together for this pre-order bonus – I am sorry I can’t do apps. And we hope to have the iOS version ready very soon. Stay tuned to our website or our Facebook/Twitter/Pinterest pages for announcements. Thanks! I’m having the same problem with the Motivated Moms download link. I submitted the information, received a download link via email about 2 hours later, but the link just takes me straight back to the “request information” page. I re-submitted the info…am waiting for another download link that will work? Hi Janie, There have been a handful of people having problems with the download link. Send me an email at susanc@motivatedmoms.com and I will help you out. Thanks! I sent the receipt and then got an email saying I had to confirm, which I did. But I haven’t recieved anything else. The link to confirm sent me to a screen that just said thank you. Is there another email coming? Thank you!!! Never mind,I got it, it just went into my promotional folder in gmail! Thank you so much!! Check your spam folder. If it’s not there, email crystal@moneysavingmom.com. Sorry for the issues! Hi there! Can we pre-order it anytime before the date is released? Just want to make sure it’s not just this week or something! Great! Thanks for the quick reply, Crystal! Will this work for Canadians? Thanks! Yes, though you may have higher shipping on the physical products. how long is this pre order promotion running for? It will be live until the book is released on January 21. Just curious as to why the release date has been moved from Jan 21 to Feb 4? Just received the email from Amazon stating that it will not be shipped until Feb 4, checked Amazon, and the release date has indeed been changed. For some reason, Amazon glitched yesterday and changed the release date on a number of books and sent out notices that the release dates were changed… when they weren’t. My publisher said that they are working on getting this corrected on Amazon, but that the release date is still January 21, 2014, as we’d originally planned for. Email crystal@moneysavingmom.com — thanks for letting us know so we could make sure to get this resolved. And sorry for the issues! I submitted my form for the freebies and confirmed my email however i havent recieved anything else about the offers. It should have come automatically in your email… try submitting the form again and check your spam to see if it’s there. If not, email crystal@moneysavingmom.com and we’ll manually send you the link. I’m so sorry for the issues!